If Carlsberg did endings to matches… they probably wouldn’t do it like that but hey, what an adrenaline rush. The roller coaster of emotion that Arsenal fans experienced yesterday was enough to hospitalise the strongest of hearts. After a weekend of favourable results from those clubs around the Arsenal it was important to maximise the advantage and obtain all three points from the game. I’m sure the players would have been aware of the Liverpool Swansea result and been reminded of the potential banana skin a fixture against one of the lower opponents in the league could pose. In fairness the performance was positive despite some questionable wastefulness in front of goal. The chances were coming but the ball wouldn’t hit the back of the net, always a dangerous situation the longer the game goes on. However you felt it was only a matter of time before the Gunners would break the deadlock. When Shkodran Mustafi rose to head home Ozil’s corner in the second half a huge sigh of relief was expelled and then it was a case of when the second goal would come so we could relax and enjoy the rest of our Sunday. More fool anyone who thought the match would play out to script, that script was ripped to shreds for good measure. From a state of total comfort our very own Granit Xhaka had other ideas with a red card challenge, I know fans have been divided in opinion of whether he deserved to go or not. I usually sit on the fence but if I’m being honest it was a red and he has only himself to blame. If this was a one off out of character error of judgement the benefit of the doubt could be given but sadly the young Swiss is beginning to get a reputation for such moments in games. I believe in the player strongly and do feel he offers a lot to the team but the disciplinary side to his game needs to be curbed because once painted with such a brush the referee is more likely to rule he is in the wrong for any contentious 50/50 split decisions. Arsenal can’t afford to have referees making their mind up on our players before a ball is kicked because you end up in situations like yesterday fighting an uphill battle with 10 men on the field. It’s not his first bit of controversy this season and there can be a thin line between reliable and liability. 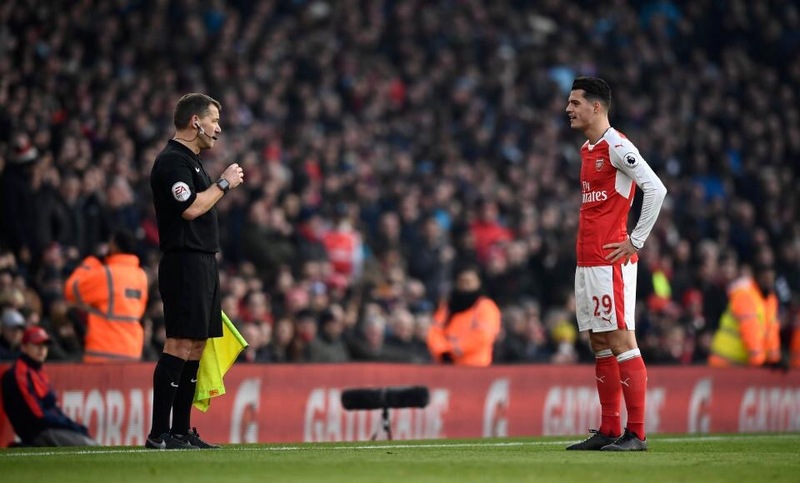 Xhaka now faces a four match ban at a time when player numbers are stretched enough as it is. You would argue that Coquelin returning is perfect timing to soften the blow until you see the challenge he put in to concede the penalty against Burnley. Ok, that’s a bit harsh I am glad to have the Frenchman back but now he needs to be wrapped in cotton wool for the next four games at least as their aren’t too many options after Coquelin and Ramsey to fill that central role right now. So as I have alluded to the red card switched the dynamics of the game from one of comfort to one of unease and tension. Burnley gained a spring in their step and despite a spirited effort to keep the team with the player advantage at bay the inevitable happened in injury time. A penalty won after a trip by Coquelin put the club and the fans in the horrible position of witnessing us throwing away maximum points when seconds away from victory. When Andre Gray blasted in that penalty the heart sank, all the negative feelings came flooding in; you could almost hear the collective beeps of mobile phones nationwide in synchronisation of whatsapps, tweets and texts flooding Arsenal fans’ phones from their Spurs, United, Liverpool and Chelsea supporting friends mocking the predicament the club had just witnessed. It started to kick off on the side-lines too; Arsene was apparently sent off by the ref and had some afters with the fourth official that is likely to put him in some very deep water. The script that was rewriting itself had not finished though, there was one final twist to this story and thank goodness that worked out as a happier ending for the Gunners. With even fewer seconds on the clock a free kick into the box resulted in a kick to the face on Koscielny and the ref awarded another penalty. There were claims that Koscielny was offside but a kick to the face is a kick to the face. It was an unbelievable turn of events as the emotion had now switched from utter dejection to hope once again. 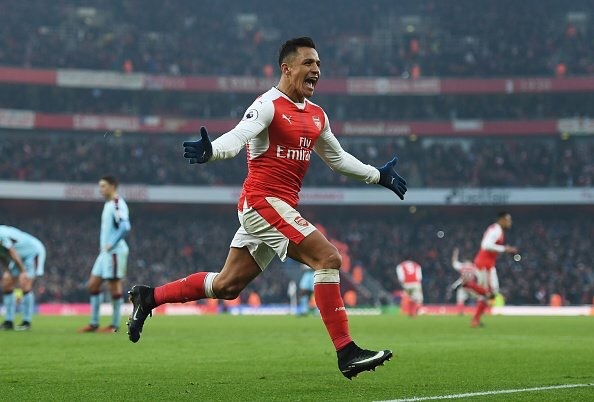 An awarded penalty is great but you still have to score it, a moment like that required nerves of steel and there was no other player on the field you would entrust with the honour than Alexis Sanchez. With a touch of nonchalance the penalty was dinked down the centre of the field and the Gunners were now 2-1 up. How as a fan could you not explode with excitement and joy at such a finish to the game? Many rival fans have mocked our celebrations but for reference think back to Man united scoring in the last minute at Hull or Tottenham scoring the last minute at West Ham to name a few. We didn’t celebrate like we had won the league but we did celebrate like a team that regained a victory in the dying seconds of the game when everything seemed to have gone against us; call it what you want whilst sucking on those bitter lemons. As it stands we just need to take each day as it comes, the fallout from this game will become clearer as the week goes on. 2nd in the league now and a game against Chelsea not too far off in the future, dropped points yesterday would have been the worst possible outcome. Now we roll on, yesterday was far from enjoyable but the final result was the most important factor. Hopefully the players will learn from all the negatives but also take encouragement from the positives. Enjoy your day people! Posted on January 23, 2017 by GambeanoSnitch. This entry was posted in Arsenal and tagged alexis sanchez, burnley fc, football, mustafi. Bookmark the permalink.